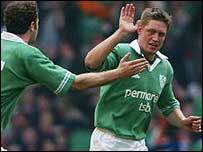 An injury-time drop goal by replacement Ronan O'Gara kept Ireland's Grand Slam hopes alive at the Millennium Stadium. The Irish looked to have blown their chances of a mouth-watering decider against England when Wales fly-half Stephen Jones flashed over a drop goal of his own in a pulsating final few minutes in Cardiff. But O'Gara, showing immense coolness under pressure, won the day for the visitors with a vital three points inside 30 seconds of the restart. Wales will take the plaudits for outscoring Ireland by three tries to two, but Steve Hansen's men remain bottom of the Six Nations table with one game left. The game began as frenetically as it finished, but it was Ireland who nudged ahead after six minutes thanks to a penalty from David Humphreys. The first try of the game came on 15 minutes, when Jones broke through from open play to scrambled over in the corner. Jones added the touchline conversion, but within five minutes Humphreys had cut the lead to one point with his second penalty. Humphreys pushed Ireland ahead in the 27th minute with his third penalty after another Welsh indiscretion in front of their posts. But the visitors were not allowed to get into any sort of rhythm, with Wales playing the only decent rugby on show in the early exchanges. Ireland finally wrestled free from the Welsh manacles in first-half injury time. Brian O'Driscoll and Leo Cullen made tentative attempts to break through before Geordan Murphy swivelled past his defender to put flanker Keith Gleeson over in the left-hand corner. Gleeson's second try immediately after the restart after Anthony Foley charged down a clearance kick by Tom Shanklin. But Wales struck back on 52 minutes with a great try. Good work by Colin Charvis and Rhys Williams allowed flanker Martyn Williams to go over for his first try for his country, with Jones adding the conversion. O'Driscoll almost crossed before Ireland went further in front when Humphreys rifled over his fourth penalty to make the score 22-14. Back came the home side again, with Gareth Thomas claiming his 29th try for Wales, with Jones slotting the conversion to make it a one-point game. Jones saw a 47-metre penalty just drift wide of the right-hand upright. But he made no mistake with a drop goal two minutes into injury time. The kicks looked as though it had given Wales a morale-boosting victory, but Irish substitute O'Gara broke Welsh hearts with his last-gasp kick. Wales: R Williams (Cardiff); M Jones (Llanelli), M Taylor (Swansea), T Shanklin (Saracens), G Thomas (Bridgend); S Jones (Llanelli), G Cooper (Bath); I Thomas (Llanelli), J Humphreys (Bath, capt), G Jenkins (Pontypridd), R Sidoli (Pontypridd), G Llewellyn (Neath), C Charvis (Swansea), M Williams (Cardiff), D Jones (Llanelli). Replacements: M Davies (Pontypridd), M Madden (Llanelli), S Williams (Northampton), G Thomas (Bath), D Peel (Llanelli), I Harris (Cardiff), M Watkins (Llanelli). Ireland: G Murphy (Leicester); J Bishop (London Irish), B O'Driscoll (Leinster, capt), K Maggs (Bath), D Hickie (Leinster); D Humphreys (Ulster), P Stringer (Munster); M Horan (Munster), S Byrne (Leinster), J Hayes (Munster), M O'Kelly (Leinster), L Cullen (Leinster), A Quinlan (Munster), K Gleeson (Leinster), A Foley (Munster). Replacements: F Sheahan (Munster), J Fitzpatrick (Ulster), D O'Callaghan (Munster), E Miller (Leinster), G Easterby (Llanelli), R O'Gara (Munster), J Kelly (Munster). "The game was very exciting"
"We need to take in what just happened"
"We had to keep our composure"